HAPPY GRAND OPENING TO DARKNESS BREWING! – While they have been open serving other breweries’ beers, this Saturday starting at 2:00 pm, you can finally enjoy a Darkness beer on draft. Live music and a taco truck too. • Ohio Hop Growers Guild Hopyard Open House – Saturday from 10:00 am to 4:00 pm. Check out their Facebook event page for more information. • 2nd Annual Beer Olympics/strong – Saturday at Ei8ht Ball and presented by Ei8ht Ball Brewing, New Belgium, Kentucky Ale, Mad Tree and Braxton. – Signups are from noon-1pm and the Olympics are from 1:00-4:00 pm. For more information, go to their Facebook event page. • Jungle Jim’s – Friday night tasting from 5:00 to 9:00 pm at both locations. Pints are usually $3. This week, it’s Revolution Brewing at both Fairfield and Eastgate. • Party Town – For Friday Night Flights this week from 5:30-7:00 pm, they are pouring TBA. It’s $2.00 for the regular sample flights. Only adults age 21 or more are admitted for Friday Night Flights. Limit of one sample per person. No shopping carts in the back room please. • Ei8ht Ball Brewing – Tonight is Free Bacon Night and they will be pouring MadTree Are You Ready for Darkness? and Barrel Aged Ye Olde Battering Ram. • Rhinegeist – Lumenocity Glow Launch Party today starting at 8:00 pm. • Down the River with Upland Brewing – This two-night event starts at Cappy’s Wine and Spirits Friday night 5:00-10:00 pm with the famous Peanut from Ei8ht Ball starting the bartender swap. Then on Saturday night beginning at 12:00 noon head to Ei8ht Ball as Sara Levin from Cappy’s finishes the bartender swap. Both nights you can enjoy Thunderbird Wings from Nashville with your Upland beers. • Wiedemann’s – At the Findlay Market this weekend. Friday 4:00-8:00 pm; Saturday 11:00 am-8:00 pm; and Sunday 11:00 am-5:00 pm. This truly is one of my favorite beer festivals of the year. For many reasons, session and lower ABV beers have become my beers of choice so this is great. If you would like to volunteer for Volksfest, send an email to volunteers@listermannbrewing.com. The best summer beer festival is back During All-Star Weekend! Volksfest is a festival for the people of Cincinnati, brought to you by your favorite local craft breweries. Held July 10th and 11th at Listermann Brewing Company in Norwood, Ohio, Volksfest will feature beers only from local breweries. The word Volk in German means people, and Cincy’s brewers have decided to come together once again to show our customers just how much they mean to us. There will be live music all day, performed by local musicians (Bands yet to be announced). Several different food vendors will be on hand to serve a wide range of food. The idea behind Volksfest is lower ABV and session beers for the hot summer days in August. There is no cost to attend Volksfest, just pay for whatever you eat and drink! The celebration goes from Friday at 5 pm until midnight and Saturday from Noon until 11 pm. The breweries involved are: Blank Slate, Fifty West, Christian Morelein, Rock Bottom, Rivertown, Mt. Carmel, Madtree, Cellar Dweller, Wiedemann, Eight Ball, Quaff Bros, Rhinegeist, Triple Digit, Bad Tom Smith, Dogberry, Braxton, Urban Artifact, Taft’s Ale House, Old Firehouse and Listermann with more to come. Some of these breweries are making beers JUST for this event! You can bet there will be some sort of All-Star theme to go along with this! We have also teamed up with the Newport Aquarium to host a penguin (this is not a typo!) at the Listermann tasting room (200 feet from fest grounds) on Saturday July 11th at Noon. Bring your kids in to meet him! Like the Oktoberfest and Starkbier Fest previously held at LBC, this event will be family and dog friendly. More info on the music and food vendors will be provided later. Good news! If you missed our beer trivia during Cincinnati Beer Week, you have another chance AND it’s part of a great new event at Bockfest this year. Join brewers and representatives from Bad Tom Smith, Blank Slate, Christian Moerlein, Ei8ht Ball, Fifty West, Hudepohl, Listermann, MadTree, Rhinegeist, Rivertown, Schoenling, Triple Digit and Wiedemann plus beer bloggers like Jesse Folk from WCPO and us for the first ever Bockfest Bock Beer Experience / Bock Beer Tasting on Saturday, March 7th from 1:00-6:00 pm. This week, it’s Green Flash White IPA through Cucumbers and Cilantro. This week, it’s Jackie O’s After Hours with coffee. Beers include Southern Tier 2XIPA, Southern Tier Warlock and Southern Tier Crème Brulee. Giveaways too. Beers include Ommegang Adoration Ale, Witte, Rare Vos, Gnomegang and Belgian Independence Day IPA. You can pair your Deschutes brew with a Black Butte doughnut from Holtman’s. Beers include Black Butte Porter, Mirror Pond Pale Ale, Mirror Mirror Oaked Aged Barley Wine, Doppel Dinkel Bock and Black Butte 26 Anniversary Porter. This is the last Burgers & Beers of the season. The beers for this week’s Pint Night Thursdays are: Main Strasse Covington – Left Hand Oktoberfest, Glendale – Sam Adams Oktoberfest and Hyde Park – Three Floyds Munsterfest. This week, it’s Three Floyds Blackheart and the cost is $8 a snifter. This week, it’s Goose Island Ogden, a Belgian-style tripel. This week, it’s Listermann / Triple Digit. The beers are Listermann Leopold, Nut Case and Planetary plus Triple Digit Chikow! and Decimation. Part of Mecklenburg Gardens’ celebration of 18 years owned by the Harten family. Happy anniversary to Tom and the rest of the family! For July, it’s their Pilsner. This week, it’s Seef bier, a newly revived Belgian style. See our earlier post for the complete list of this summer’s Burgers & Beer schedule. The beers for this week’s Pint Night Thursdays are: Main Strasse Covington – Angry Orchard, Glendale – Widmer Alchemy and Hyde Park – Rhinegeist Puma Pils. As usual, the cost is $25.00 per person. Call 513-231-5550 to make reservations. On draft will be Kentucky Kolsch, Kentucky Stallion Maibock, Kentucky Bourbon Peach Wheat, Upland Triple and Upland Campside. Upland wheat and Kentucky Bourbon Barrel will be available in bottles. This is also a comedy show supporting a young comic named Ally who headed to NYC to perform for the first time. $1 of every Upland/Alltech beer sold will go to the Dragonfly Foundation and to help with Ally’s travel expenses. There will also be a silent auction, raffles and split the pot. $5 donation for the comedy show recommended. 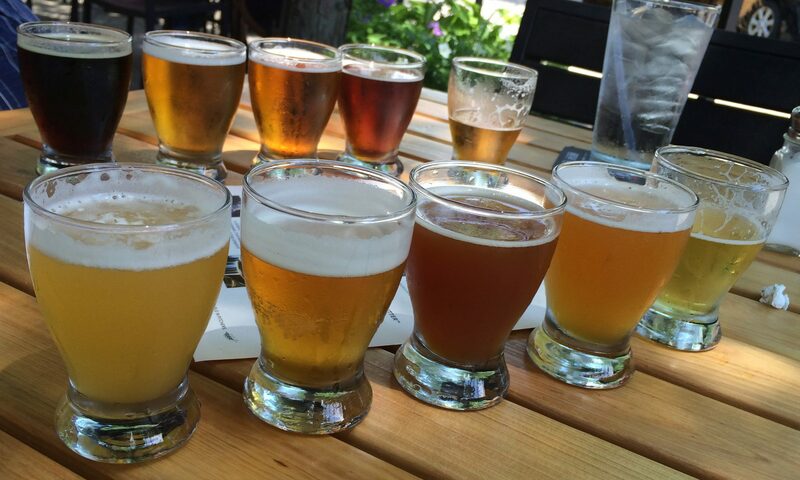 Beer tastings with heavy hors d’oeuvres. Featured beers include: Christian Moerlein, Rivertown, Mt. Carmel, Goose Island, Widmer Brothers, Leinenkugel, Oskar Blues, Great Lakes, Sam Adams, New Belgium, Kona, Upland, Full Sail and more! Advance ticket purchase required. To make reservations, go to http://www.greatparks.org/events/beer-and-wine-tastings. Tapping of their Rookie Anniversary IPA as well as special rarity keg tappings every 2 hours. Live music, food, games and surprises. In addition, the Ohio Chapter of Girls Pint Out will be getting together at this event at 6:00 pm. Check out their Facebook event page for more information. This month, the featured beer are from Christian Moerlein. See our previous post for more information. Beer and beards – a match made in heaven? It sure seems like it. For more information on this very unique event, check out their Facebook event page.